Granada is full of legends and love stories. Nowadays, in the Palacio de los Córdova, there is a fountain of eternal love, where young couples go to leave flowers and ask for their love to last forever. Do you know why? It took place a long time ago in Granada, according to those who read the documents that they discovered – a love story between a beautiful young Spaniard of noble descent and a handsome merchant from Naples. It took place in the first decades of the 17th century, when there was still conflict between the Moors and the Old Christians from Castile in Granada. The maiden, with skin as white as snow, eyes like a skylark and rose petal lips, was called Doña Elvira Padilla. She was not yet fifteen years old but already dazzled with her graceful figure and curls that flowed down over her shoulders. She was also exceedingly honest and kind. She was a saintly young girl who respected her elders. Each morning, accompanied by both the governess and her mother, Doña Catalina de Mendoza, she attended religious services in the nearby convent; the Comendadoras de Santiago. The daughter of Granada’s main nobleman, Don Luis Padilla and Miota, Alderman and administrator for the Tribunal de las Aguas (Water Tribunal). 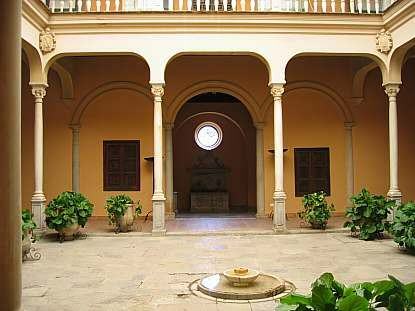 Doña Elvira lived in an impressive traditional house in Granada, with a courtyard and a high-walled garden where she spent the afternoons reading and embroidering next to the fountain her father had given her for her birthday twelve years prior. The fountain was made of delicate white marble and the flowing water whispered a happy tune that made the young girl dream and think of the love scenes she read about in the books she stole from the governess. The garden was a little paradise for the family; cypress trees grew up the walls, hiding them from nosey onlookers. Her beau was called Gaspar de Facco, the son of a famous Neapolitan silk and cloth merchant called Fabriccio de Facco. He had come to Granada to seal a deal between his family business and the silk merchants in the Alcaicería. Facco had a charming face and an elegant demeanour, with a hint of the mischief that was so characteristic of Neapolitan merchants. As destiny is somewhat capricious, one morning Elvira, accompanied by her governess, went to buy thread and lace from a shop next to Plaza Bib-Rambla. As she was leaving the shop, her eyes met with those of a lad who was heading down into the square. When he caught sight of this pretty young woman, without saying anything, he left his companion and stood next to Elvira so he could watch her. Gasper was left paralysed by her beauty and Elvira was hypnotised by his penetrating stare, which gave her a strange sensation that she had never felt before. The duchess, aware of what was going on, took Doña Elvira by the arm and whisked her away towards the house. Head over heels in love, Gaspar asked the sellers he traded with about the beautiful lady, in hope of finding about her family and where she lived. Knowing how very strict her father was, and how difficult he could make it for him to get closer to her, being an only child and from such an important family, he headed out in the dark of night to watch her from close to the house, hoping to see her and express his feelings. After so many fruitless attempts to see her, he decided to make friends with one of the servants at the house. That’s how he managed it. One morning, and for just a few maravedís (old Spanish coins), he managed to get a house maid to take a letter to Doña Elvira, and waited until sunset for her response. Elvira, white as a sheet, could not stop thinking about the young boy that had won her over with just a look. Gaspar was next to the fountain when the servant handed her the letter. In the letter, he expressed his feelings and his desire to see her, begging her to reply if she felt the same way towards him. The young girl, held captive by her desire to meet him and see those mischievous eyes once more, without thinking about the consequences of her actions, wrote him a letter to express her wish to meet him. A number of days like this went by, between letters and sighs by both of them, until Elvira decided to meet him in the garden, next to the fountain where she had sighed many a time and shed many a tear. The following night, they met in the garden at the time they had agreed on. Their hands intertwined, hearts racing, and between whispers and kisses they declared their love for one another. That’s how the days passed, flying by. Realising that he would soon have to return to Naples because the trade deal that brought him to Granada was finalised, Gaspar decided to speak to Elvira’s father and ask for his daughter’s hand in marriage and for permission to take her back to Naples with him. He requested a meeting with Don Luis Padilla and they met in his office at home, somewhat expectantly. When Gaspar informed him of his intentions, Don Luis, completely unaware of what was going on in his own home, enraged and threatening, prompted him to leave town, without his daughter, whom he would have to punish for having met the boy in secret. Don Luis had arranged for his daughter to marry Iñigo González de Mendoza, the reeve’s son and a good friend of his. Elvira was in the garden and when she heard her father’s voice, she dropped her embroidery and went up to her room, packed her clothes in a hurry and escaped out into the street. She then hid around a bend whilst she waited for Gaspar. Night was closing in and when Gaspar came out into the street, silent and doubled over in pain, he met with his lover, and in between sobs and cries told her that his honour was at risk, still fearing horrible punishment from her father. Death would be his only escape. Hand-in-hand and afraid that when Don Luis noticed that his daughter was missing, he would send his servants or call the constable to go and look for them, they decided to go quickly to the inn where Gaspar was staying, collect his belongings and head to Motril, where his ship back to Naples awaited. At dawn they set off on their escape via the Puerta del Rastro, heading towards the coast. When Elvira’s father noticed that she was missing, and having caught on to what was happening, ordered for the runaways to be captured. In the Alhendín area, in a place known as “Suspiro del Moro”, the lovers were surprised. Gaspar, knowing what would happen to them if they were detained, resisted capture fighting until he was fatally injured. Elvira fell to her knees next to him, and held Gasper in her arms, and with his last breath said “your love is the most incredible thing that has ever happened to me and I will love you for all eternity”. Elvira felt as though she herself was dying, as though she had left her own body, without responding to the voices of the servants who captured her and took her to her father, who, overwhelmed by rage and bitterness at seeing his honour and glory ruined, ordered for Elvira to be held in the Convento de las Comendadoras, for the rest of her life. Elvira was left devastated by the death of her lover, and before leaving for her “prison”, she asked one thing of her father; for her to be allowed to say goodbye to her garden. Once in the garden she sat next to her fountain, remembering each moment of such happiness with Gaspar, and suffering greatly, she cried bitterly and collapsed to the ground next to her fountain. When her mother went into the garden, she saw Elvira on the ground, and the fountain – her fountain, full of beautiful flowers. They say that when her parents passed away, as they left no offspring, the house and the garden were abandoned and the loved-up couples who knew the legend of the fountain and Doña Elvira, snuck into the garden to swear eternal love by the “fountain”, throwing flowers into it in order to seal their love. The fountain of eternal love, or of Doña Elvira, M. S. R. H., M. M. J.A. Note: La Fuente de Doña Elvira o del Amor Eterno is currently located in the gardens of the Palacio de los Córdova, in the area known as the “Jardín Romántico” (“romantic garden”).